Mr Krabs: Yeah, we'll see you after your lunch break, Squidward. 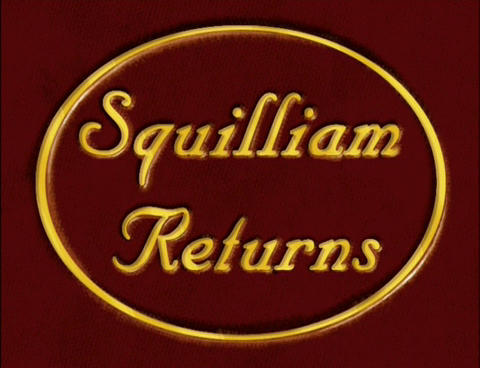 Squilliam: (talking to a group of people) So, I just took my private yacht across my private lake to my private heliport. It's the only way off my private island. Squilliam: On your lunch break, eh, Squiddy? Squidward: Yes...I mean no...I mean...uhh, uhh, hey, whatcha been up to? Squilliam: Oh, just succeeding in everything you've failed in. Squidward: You are no great shakes, Squilliam Fancyson. Anyone can be a big shot in a hick town like Bikini Bottom. Squilliam: Oh, is that so? Let's hear what you've accomplished since high school, Squiddy. Squidward: (thinking to himself) Don't be intimidated, Squidward. Try to imagine him in his underwear. (imagines Squilliam as a hot underwater model) Oh no, he's hot! (to Squilliam) I'm, uhh, in food service. Squidward: (thinking to himself) Don't lie. Lying always makes it worse. (to Squilliam) I own a five-star restaurant! Squilliam: Squidward, I had no idea you were such a success. Mr Krabs: I know, this really is the world's smallest violin. (violin is shown) See? Squidward: Mr Krabs! Please let me run the restaurant for just one night! I really need to impress Squilliam. Mr Krabs: Sq-Sq-Sq-Squilliam? (Squilliam's unibrow appears above Mr Krabs' head) That guy who made millions doing what you wish you could do? Squidward: Don't rub it in. Squidward: Alright, listen up. Men, Squilliam Fancyson will be here in twenty minutes. Therefore, we need to turn the Krusty Krab into a fancy restaurant as soon as possible. (Patrick appears next to Spongebob with an army hat on his head) Patrick, what are you doing here? Patrick: I thought the Corps would help me straighten out my life, sir! Squidward: The Corps? What the...Patrick, this isn't the... (sighs) Beggars can't be choosers. Can you take hats in a dignified and sophisticated manner? Squidward: (shuts Patrick up) Alright, I've heard enough. You've got the job. (walks off) Mr Krabs, didn't you once serve on the S.S. Gourmet? Spongebob: What can I do? Squidward: I can't believe I'm saying this, but Spongebob, you're going to have to be the waiter. Squidward: It's the guy who goes to tables and takes orders. Spongebob: Do other restaurants do that? Spongebob: "How To Become a Fancy Waiter in Less Than 20 Minutes." Don't worry Squidward, I'll memorize every page, right down to the punctuation marks. Squidward: Alright, I've got all the positions filled. I just might pull this off! Squidward: He's just the hat-check guy, nothing essential! (an explosion in the kitchen is heard. A bunch of green goop flies out) What happened? What is it? Mr Krabs: Peas! (a can of peas, still in the can, is on the stove) Made 'em the old-fashioned way. Mr Krabs: That's the appetizer. Squidward: But I thought you said you were the head chef on the S.S. Gourmet? Spongebob: I can't do it. I can't do it, Squidward. Squidward: Spongebob, hold on! Let's just take a second here to relax. (Spongebob lowers his arms) Little more. (Spongebob lowers his arms more) Little more. (Spongebob's face falls to the floor) Good. Now, I want you to empty your mind. Spongebob #1: Just got an order from the boss: Dump everything that isn't about fine dining! Spongebob #1: Everything! (eveyrone starts to panic and throw everything away) Come on, let's get moving! (walks up to another Spongebob) Hurry up! What do you think I'm paying you for? Spongebob #2: You don't pay me. We don't even exist. We're just a clever visual metaphor used to personify the abstract concept of thought. Spongebob #1: One more crack like that and you're out of here! Squidward: How do you feel? Spongebob? (snaps his tentacles as Spongebob drools) This isn't working! I gotta go tell Squilliam I need more time! (runs out the door) I'll just go to Squilliam's house and tell him... (stops because he sees Squilliam and the group) Squilliam, you're here! Squilliam: Hello, Squiddy! We're all ready to be dazzled by your five-star restaurant. Squidward: Wait, Squilliam, I've got to explain! Squidward: (whispering) How did you do all this? Spongebob: It was easy, once I cleared my mind. Squidward: But what about Krabs and Patrick? Spongebob: (saluts with all the hands that helped)Thank you, sir. Spongebob: If you need anything else, just call. Squidward: Spongebob, I can't thank you enough for all you're doing! Squidward: It worked. I can't believe it! Squilliam thinks I own a five-star restaurant. Time to rub it in his face. (Spongebob is combing Squilliam's unibrow) Well Squilliam, I'm waiting. Squilliam: Alright, I admit it. Everything is fabulous. The food, the atmosphere -- everything's flawless! Squidward: (puts a foam finger on his left hand) And I need you to wear this. Squilliam: Oh, eh, "Squidward Tentacles has the fanciest..."
Squilliam: Yes, your name, son. Squilliam: (chuckles) No, your name. Spongebob: Uhh...err...the fork on the left? Squidward: Stop joking. Tell him your name. Spongebob #3: What's his name? What's his name? I've got nothing on a name. Squilliam: Well Squiddy, I'm waiting. Squidward: Ok, I admit it, I'm a fraud! This was all a futile, pathetic attempt to impress you. This isn't really my restaurant. I'm just a cashier! Spongebob: (walks over with a bag of ice on his head) I got such a headache. What's going on with you? Squidward: Oh, the usual. (Mr Krabs walks over and plays the violin) Would you get out of here?